Having the highest yield doesn't necessarily mean a company has the best yield. In fact, sometimes a high yield can actually be a sign of weakness. The good news is that the high-yielding upstream MLP segment is actually a pretty safe bet for investors. These oil and gas companies, although structured as an MLP or LLC for tax purposes, are, at their cores, income producing machines. That being said, not all of these high yields come without risk. As we drill down into some of the top upstream MLPs, you need to consider which distribution is best for your risk tolerance. For me, one company is clearly the safest choice, and that's enough for me to be able to sleep at night, because I know that the company will continue to securely produce the income I expect for years to come. At first glance, it would be easy to be drawn into QR Energy's extremely high yield. The question that needs to be answered is, how safe, really, are any of these yields? And, which company would be best for your yield-hungry portfolio? Let's dig a little deeper and see if there's more to the story. Do you see that green bar consistently hitting the top line at 100% hedged? That's LINN Energy, a company that's called its hedging strategy its "secret sauce." Before we declare LINN the clear winner, let's drill down a bit deeper into each company. BreitBurn at most hedges 78% of its production, and its hedges really fall off after 2015. If you believe commodities are heading higher, that's not a bad thing. However, if you want secure cash flow, the risk is that the company won't be able to deliver it on its unhedged volumes. The other item to note, which you can't see on the above chart, is that a majority of the company's hedges are swaps that are fixed-price contracts. The company uses very few puts or collars to hedge its production. Because the company doesn't spend money to buy puts, it can afford a slightly higher distribution. However, of the companies on this list, BreitBum is the least secure. 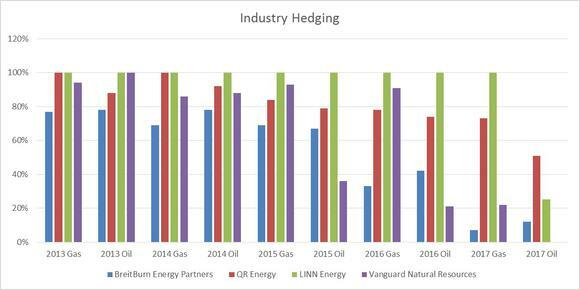 While LINN Energy might be the clear hedging leader, the runner-up, with its consistently above average hedging program, is QR Energy. You'll note that QR Energy has hedged 100% of its gas through the end of next year, while its oil hedges are above 80%. That puts the company's remarkable 11% distribution on pretty stable ground. Also on solid ground is Vanguard's distribution. You'll notice that its gas volume is pretty well hedged though 2016, though, like BreitBurn, it's all fixed-priced swaps, leaving little upside. However, given that 60% of the company's production is natural gas, the company's extra effort in hedging here helps it keep that distribution safe. As you can see, a great portion of the company's production is protected by puts. While it does cost the company some money to insure its cash flow, it also allows for additional upside if commodity prices rise. Despite having the smallest yield, LINN Energy, in my opinion, has the safest distribution of the bunch. Not only does the company hedge 100% of its production through at least 2016, but that production has some upside, thanks to the company's use of puts. Another great thing about LINN is that you can invest in this cash machine without the headaches of a K-1, by choosing instead to invest in its affiliate, LinnCo . Because LinnCo only owns LINN's units, you're getting the access to LINN's cash flow, but in a structure that sends a 1099, not a Schedule K-1. That being said, there's nothing wrong with the other distribution; you're just taking on a bit more risk for that higher yield. However, you still might be thinking that these dividend yields seem too good to be true. If that's the case, and you're on the lookout for some more high-yielding stocks, The Motley Fool has compiled a special free report outlining our nine top dependable dividend-paying stocks. It's called "Secure Your Future With Nine Rock-Solid Dividend Stocks." You can access your copy today at no cost! Just click here. The article 1 Reason Why This Dividend is Safer Than its Peers originally appeared on Fool.com. Fool contributor Matt DiLallo owns shares of Linn Energy, LLC, and Linn Co, LLC. The Motley Fool has no position in any of the stocks mentioned. Try any of our Foolish newsletter services free for 30 days. We Fools may not all hold the same opinions, but we all believe that considering a diverse range of insights makes us better investors. The Motley Fool has a disclosure policy.